* Who Plays? Why Play? Who can play? Why play? It's more than just a game. Its "sheer joy"
There's something about the game of baseball that lights up a child's eyes. It's an experience that every child deserves. But for children facing intellectual and /or physical disabilities, that opportunity can often be a difficult first step. 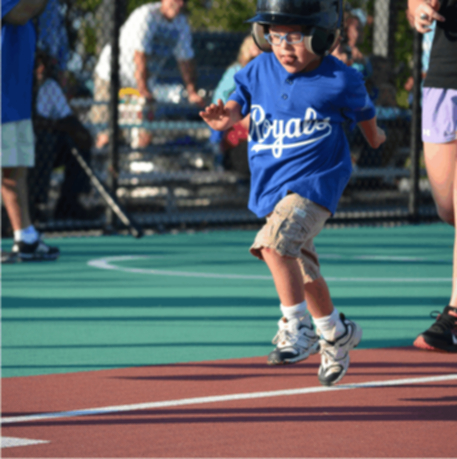 We welcome ALL children (ages 5 - 21) with an intellectual and /or physical disability who have a current IEP and is not capable of playing is a traditional baseball program. We strive to be inclusive and commit to welcome all eligible players. We can't wait to see you playing ball on our "Field of Dreams"! The Miracle League of High Point has come to realize that we not only serve children with special needs but also their parents and siblings. Caring for a child with a special needs demands total dedication and unconditional love from every member of the family. Positive attention they receive as a Miracle League "All Star"
The Miracle League of High Point is a North Carolina 501(c)1 tax exempt government entity.